MUSIC FOR PURCHA$E - Hummmusic! Recording music is not for the faint of heart. Holy Spirit guided me through every step. Thank YOU, Jesus!!! My prayer is that God, The Father, will bless you as you listen to the words and music that He has been giving me for over 20 years. It is the time of release; so here I go. The message is as timeless as God, HImself. 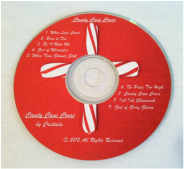 Candy Cane Cross Christmas album is one of God's greatest gifts through me. The lyrics continue to penetrate my soul and I still feel undone by The Father's kindness to allow me to birth this album. I produced this album myself, and even mixed it down (sound engineered it myself). 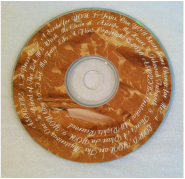 It is recorded very plainly, so as to showcase the melodies and lyrics of the songs. This album was produced on a 16 track hard disk recorder and retails for $10. If you would like to financially invest in my journey, please give any cash or checks to Miss JoAnn Davis. Please make checks payable to: Landmark Enterprises. Thank you for blessing my life!! !